As a child, I loved the color purple. It was the second best color after pink. how can anyone not love the color purple? 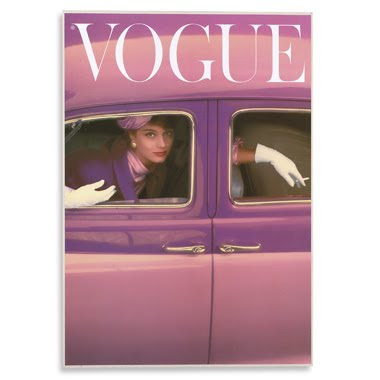 My favorite Vogue vintage print there. Love the muted purples, like wisteria on the vine. is dat niet het mooie van paars??? je hebt paars, en paars;) en een mooie diepe donkere kleur paars kan een ruimte iets chique's geven, luxe uitstralen. Maar een misty kleur paars geeft weer iets liefs en teders, terwijl een HELDERE kleur paars(volg je me nog?? ;)) toch ook wel het voorjaarsgevoel kan aanwakkeren hoor......maar voor mn kleding kies ik voor de mistyvariant, en voor in huis...lavendel.....dat is ook paars...die mogen we niet vergeten he ;)! Love that first vintage image. Now that I think of it I need to add some of it to my wardrobe. It just has to be the right shade to look good on me. I really like the dress on the left. I have love purple for years. Some would go as far as say it's my signature color, except I don't wear it all the time, I just really love it. Oh such beautiful images! I loved the colour purple as a child and much like you grew away from it as I got older. Luckily I have come back to my senses since it is one of my best colours! Love both of those dress! I adore the color on the wall. It looks so nice!! And I'll take both of those dresses, please!!! Hope your day is lovely!!! I never liked purple, I think I preferred "earth tones", whatever that means. I grew to appreciate it again when I saw how beautiful it was in the garden, particularly juxtaposed with vibrant orange, and how it was often mixed WITH earth tones in textiles. Now a splash of purple is fine with me!